Donegal Castle is situated in the middle of Donegal Town, County Donegal, in the northwest corner of Ireland. The castle is built on a rocky outcrop along the River Eske. The original tower house was built sometime in the 1400s by the great O'Donnell Chieftans. The O'Donnell Clan was one of the leading Gaelic clans dating back to the 5th century in Ireland. They were fishermen and mariners who ruled the Donegal area. In about 1600, Chief Hugh Roe O'Donnell was defeated and forced to flee to Spain. O'Donnell and other Gaelic chiefs left in what was called the "Flight of the Earls". O'Donnell ordered that the castle be destroyed as he left and it was set on fire. In 1611 the partially destroyed castle was given to an English Captain named Basil Brooke. 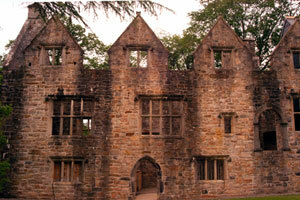 He built a new Jacobean Manor house next to the tower and had the old tower rebuilt. The Brooke family did not stay long in the new castle. The castle was left to fall into disrepair in the 18th century after Cromwell invaded the area. The Tower House of Donegal Castle has been restored to a very nice condition to tour today. The first floor is bright and pleasant and has a large carved fireplace with the Brooke and Leicesters coats of arms displayed on the wall. You can see ornate Persian rugs and beautiful French tapestries when you tour the rooms which have been decorated to show the different styles of the previous owners. 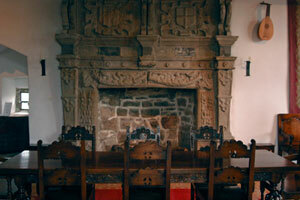 The second floor has been left a large open area with interesting display panels showing the history of the castle. The wooden roof and beams are nicely done. You will want to spend some time in Donegal Town. It has a pleasant town square and friendly people. There are many small shops where you can browse and restaurants where you can enjoy coffee or tea with a scone. The cliffs of the Slieve League Mountains to the west from Donegal Town are spectacular! It is worth your time to drive through Killybegs and to the lookout point and trail off of R263.You can see for miles over the sea from the highest cliffs in Ireland.